My Blog - "Literary History in the Landscapes of Tamil Nadu." "Literary History in the Landscapes of Tamil Nadu." After four months of living in Tamil Nadu on a Fulbright fellowship, I have begun to reflect on the many different ways in which my research project is enhanced by residing full-time in India. My project investigates the Tirukkuṟaḷ, a well-known poetic text of Tamil verses composed by a poet named Tiruvaḷḷuvar perhaps around the fifth century CE. While much of my research involves the quiet work of reading and translating verses from the original Tamil or pouring over manuscripts and commentaries, the experience of living in Tamil Nadu has brought the verses to life in ways I could not have anticipated. One of the ways in which my research has been enhanced is that I have been able to better understand how the natural landscape of Tamil Nadu shapes the poetry of this text and how the text uses ideas about landscape as a way of expressing poetic ideas to its readers or listeners. Much of classical Tamil literature uses the various landscapes of Tamil Nadu as a major literary device. The oldest poems, commonly referred to as Caṅkam literature (pronounced “Sangam”), for example, describe five different landscapes: kuṟiñci (mountains), mullai (forest), marutam (farmland), neytal (seashore), and pālai (desert). Each of these landscapes is associated with a particular emotional state in the context of a romantic relationship, both before and after marriage. The mountain landscape, for example, is most commonly associated with the joyful union of lovers, while the seashore is the setting in which one of the lovers—usually the female heroine—waits anxiously and impatiently for the return of her beloved. It is easy to read about these themes in the abstract and to read the poetry with some of the natural landscape context in mind. However, it is another thing entirely to actually spend some time living in Tamil Nadu and traveling throughout the region to understand just how incredibly diverse the natural scenery of South India can be, and how shifting from one location to another can affect one’s emotional state in meaningful ways. 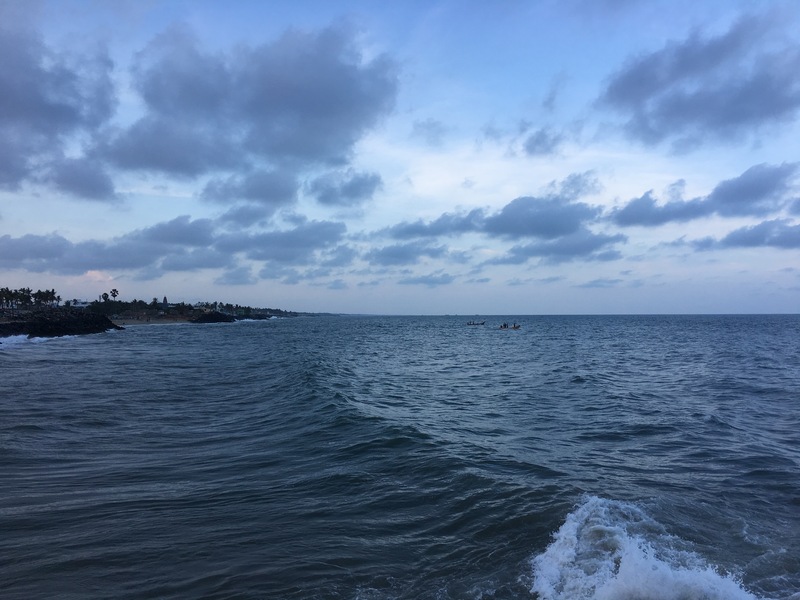 Having settled in Pondicherry for much of my research, I have had plenty of opportunities to experience neytal, or seashore, to full effect. I was fortunate enough to be able to rent an apartment right on the beach, so all I have to do is open my front door for stunning views of the Bay of Bengal. Unlike typical American expectations of beach life, living near the Bay of Bengal gives you a sense of the power of the ocean, and it can be intimidating in its strength. Every evening, the waters turn rough and choppy, creating an almost eerie feeling as I make my way home from a day of work. And the monsoon rains of November and December bring the constant threat of powerful tropical storms. Witnessing the sea in these ways, I can better understand why this landscape was associated with the anxiety of separation from one’s lover! Over the holidays of Christmas and New Year, I was able to travel to some other parts of Tamil Nadu to see firsthand some of the other incredible landscapes of Tamil Nadu. I traveled with colleagues for a few days to Coimbatore, where we stayed at a local resident’s farmhouse. Walking around the property at sunset, I was able to see stunning views (and take some beautiful photos!) of the cultivated fields, which brought the landscape of marutam, or farmland, to life in a new way for me. 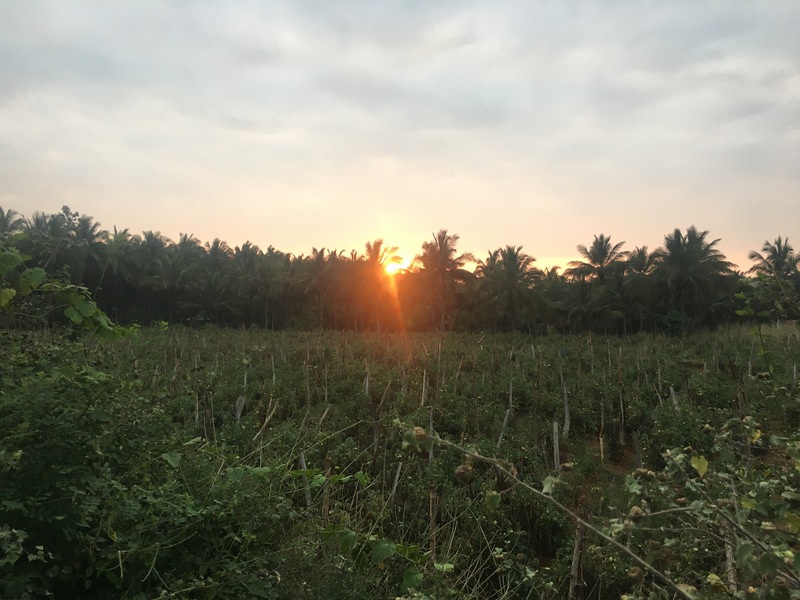 While in classical Tamil literature, marutam is often the setting for the quarrels that take place between lovers after marriage, my journal to this farmland was nothing but enjoyable! 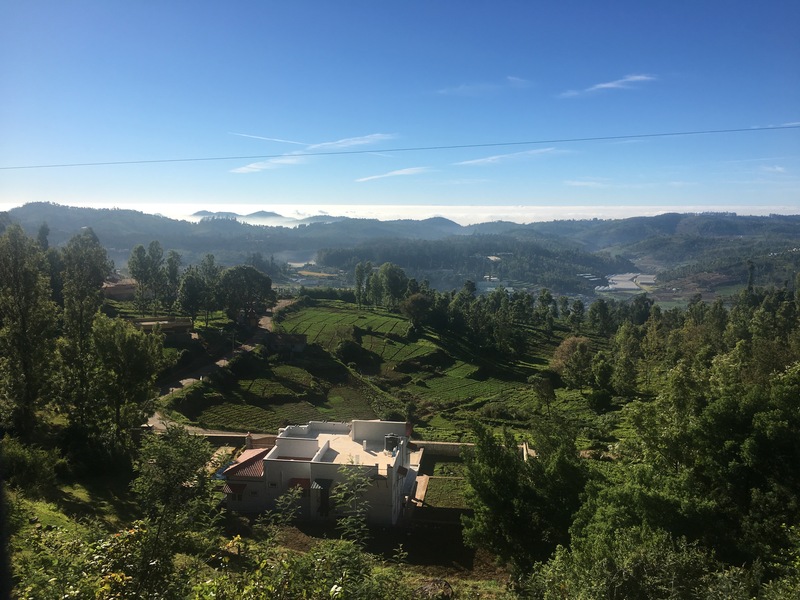 After a few days in Coimbatore, I decided with a friend to take the bus further up into the mountains to visit the towns of Conoor and Ooty, known for their scenic mountain views and cool climate. While for some, the journey up the mountain by bus may be quite harrowing (the bus takes on each hairpin turn with alarming speed), passengers are rewarded with stunning views of the mountain landscape that only get better with the increase in altitude. From the wide, open valleys to the bright green tea plantations, the mountain views bring an incredible sense of happiness and calm. It is easy to see why classical poets associated this landscape above all others with the joyful union of lovers. How could anyone feel anything but joy with a view like this? In these ways, living and traveling among the various landscapes of Tamil Nadu has given me a better sense of why these natural regions took on such an emotional hue for early Tamil poets, and it has made me a better reader of classical Tamil poetry. Given that the focus of my research is on the Tirukkuṟaḷ and its reception history, and that this text takes up the classical Caṅkam themes in which natural landscapes shape emotion, I will be able to better understand and interpret this text and its commentaries for having experienced firsthand the natural beauty, power, and diversity of South India. https://github.com/tk120404/thirukkural Using online resources and converted thirukkural to json format. To make it simple for others to use it in the studies or research.